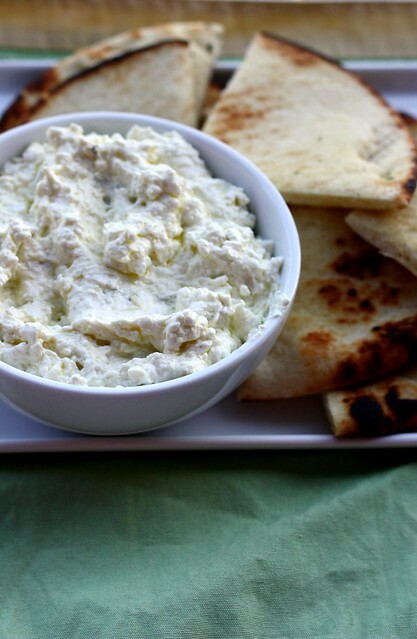 Tyrokafteri (Spicy Feta Cheese Spread) – Elly Says Opa! When I first came across this spread in Maria’s blog, I felt like sort of…sad. You see, I grew up in a VERY Greek household, ate a lot of Greek food (aside from restaurant eating, only Greek food, actually) and yet, somehow I had made it my whole life without ever eating tyrofkafteri. What the hell, man?! I don’t know how I missed out on this stuff. Maybe I was too busy stuffing my face with tzatziki and skordalia to ever notice it. Maybe it’s because my family isn’t particularly into spicy foods. I don’t know. All I know is I’m really glad it exists. The premise is simple: whipped feta spiced with hot peppers. (Tyri is cheese, kafteri means hot.) I looked at several different recipes, and the type of peppers used was all over the map. I decided to use banana peppers but feel free to use whatever you want. If you don’t have a spicy pepper, or you want it even hotter, just add a little crushed red pepper, like Maria did. 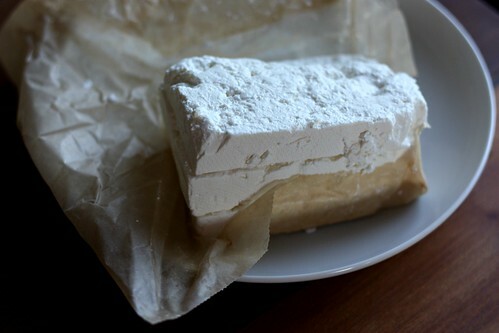 One thing I do insist is that you buy some good quality feta. We had a Greek-appetizers-for-dinner-night one recent evening, and this was served with pita. I bought Greek pita and then lightly oiled it and stuck it right over a gas burner for a couple seconds per side to crisp the edges and warm it up. By the way, if anyone out there has a recipe for Greek pita, I NEED it. Greek pita is softer and doesn’t really have a pocket, so it’s not like the standard recipes I’ve come across. Until then, Kronos and similar brands will have to do! Place the banana peppers directly over a gas flame (or under a broiler), turning often, until blackened spots appear on all sides. Place in a bowl and cover with a clean towel until cook enough to handle. Peel, seed, and remove the stems from the peppers; then, chop them. Add the peppers, feta, Greek yogurt, and cider vinegar to the bowl of a food processor and processes until fairly smooth. Slowly stream in the oil, while continuing to pulse (you may need more or less, depending on your desired consistency). Season with salt and pepper to taste. Refrigerate for at least an hour.